THE Woking community joined forces with military personnel past and present in a tribute to our brave armed services over the weekend. 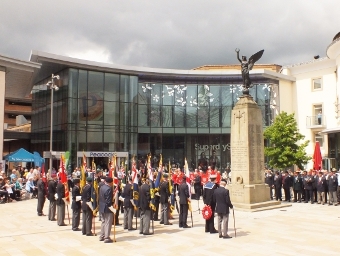 Many hundreds gathered in Jubilee Square, around the war memorial of course, to pay homage at the annual and emotional Armed Forces Day ceremony. The Woking Royal Naval Association marched through the town to the square, where a short service was held with speakers representing the RAF, Royal Marines and the Army. Families, veterans, cadets, service personnel on leave, and residents of all ages showed support and respect, singing along to old war songs such as Pack up Your Troubles in Your Old Kit Bag accompanied by the Almac Bisley Brass Band. Knaphill resident Anne Harwood spoke proudly of the ceremony and those who attended. The representatives of the Armed Forces gave their final salute, and made their way out of the square and back towards the Railway Club- where they quickly took refuge due to a sudden downpour. Here the Veterans exchanged stories with serving personnel and the cadets- enjoying refreshments as well as each other’s company. Originally named Veteran’s Day, plans were first announced during February 2006 by Gordon Brown, in the aim to ensure the contribution of veterans was never forgotten. It became part of the “Veteran’s Awareness Week” and changed its name to Armed Forces day in 2009. While Remembrance Day concentrates on commemorating the fallen and those who have died- the Armed Forces Day is dedicated to the living (current/former) servicemen and women.